Protein is incredibly important for good health. It’s a nutrient that must be consumed every day to meet your body’s needs. The Dietary Reference Intake (DRI) for protein is 0.36 grams per pound of body weight, or 0.8 grams per kilogram. However, a lot of evidence supports a higher protein intake for weight loss and other health benefits. This article takes a detailed look at protein’s beneficial effects and provides guidance for achieving the best results on a high-protein diet. What Is Protein and Why Is It Important? Protein is one of the three macronutrients, along with carbs and fat. 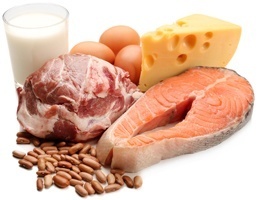 Repair and maintenance: Protein is the main component of your muscles, bones, skin and hair. These tissues are continuously repaired and replaced with new protein. Hormones: Chemical messenger proteins allow cells and organs in your body to communicate with each other. Enzymes: Most enzymes are proteins, and the thousands of chemical reactions that take place throughout your body are driven by them. Transportation and storage: Some proteins help deliver important molecules where they’re needed. 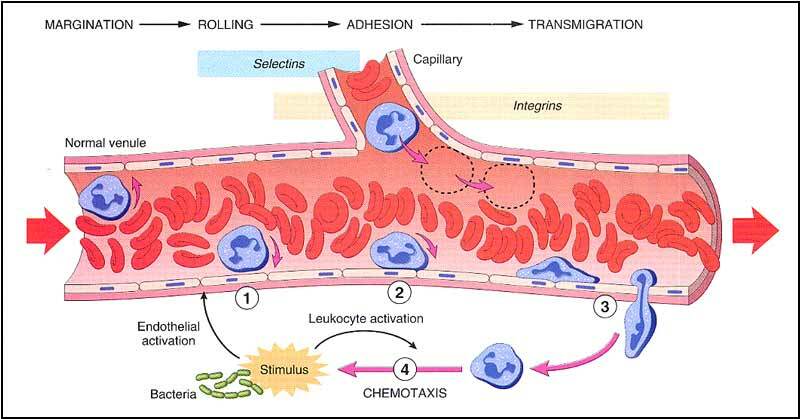 For example, the protein hemoglobin carries oxygen to your body’s cells. Protein is made up of smaller units known as amino acids. Of the 22 amino acids, 9 are considered “essential,” meaning they must be consumed in food because your body can’t make them. Importantly, some foods provide better protein than others based on their amino acid profile. Generally speaking, animal products are considered “complete protein” because they contain all the essential amino acids in the optimal amounts that your body needs. These include eggs, dairy, meat, fish and poultry. Vegetable proteins don’t provide adequate amounts of every essential amino acid but can be combined with other plant sources to make complete protein. Beans, legumes, grains, soy, nuts and seeds are examples of high-protein plant foods. Although protein quality is important, the amount of protein you consume is key. Many researchers believe that the current protein recommendations may be too low to stay truly healthy in the long term (1). Summary: Protein serves a number of important functions in your body. It is made up of individual amino acids, including many that your body cannot create on its own. Research suggests that increasing your protein intake may have impressive effects on your appetite, metabolic rate, weight and body composition. Eating more protein may help suppress your hunger and appetite for hours after eating. Protein increases production of hormones like PYY and GLP-1, both of which help you feel full and satisfied. 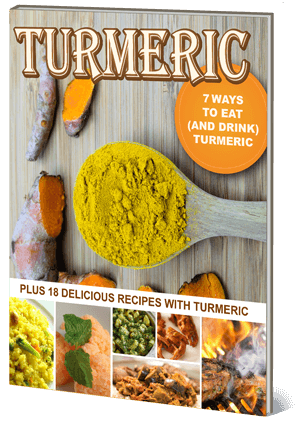 In addition, it helps reduce levels of ghrelin, also known as the “hunger hormone” (2, 3, 4, 5, 6). In a controlled study of 12 healthy women, the group that consumed a high-protein diet experienced higher GLP-1 levels, greater feelings of fullness and less hunger than the group that ate a lower-protein diet (6). Due to these effects on appetite and fullness, a higher protein intake typically leads to a natural reduction in food intake. In another study, when 19 healthy young adults were allowed to eat as much as they wanted on a diet consisting of 30% protein, they consumed an average of 441 fewer calories per day than when they followed a diet consisting of 10% protein (7). Interestingly, another reason protein is so satisfying seems to be related to the significant increase in metabolic rate that occurs during its digestion (8). A higher protein intake may increase the number of calories you burn. Protein digestion appears to boost metabolic rate by an impressive 20–35%, compared to a 5–15% increase for digesting carbs or fat (9). In fact, several studies have found that when people eat diets high in protein, they end up burning more calories for several hours after eating (8, 10, 11, 12, 13). In a study of 10 healthy young women, consuming a high-protein diet for one day was shown to increase metabolic rate after meals nearly twice as much as eating a high-carb diet for one day (13). Not surprisingly, protein’s ability to suppress appetite, promote fullness and increase metabolism can help you lose weight. Several high-quality studies have found that increasing protein intake promotes weight and fat loss (14, 15, 16, 17, 18). In a six-month diet study including 65 overweight and obese women, the high-protein group lost an average of 43% more fat than the high-carb group. What’s more, 35% of women in the high-protein group lost at least 22 pounds (10 kg) (16). Typically, when you reduce your calorie intake, your metabolism slows down. This is partly due to muscle loss. However, research suggests that a higher protein intake can help protect against muscle loss and keep your metabolic rate up (15, 17, 19). In one large review of 24 studies that included over 1,000 people, high-protein diets were found to be more effective than standard-protein diets for losing weight, preserving muscle mass and preventing metabolic slowdown during weight loss (15). Importantly, standard or high-protein diets can be effective for everyone. But interestingly, one European study concluded that based on different gene types, high-protein diets would be especially effective for weight loss and maintenance in 67% of the population (14). Summary: The ability of high-protein diets to decrease hunger, increase feelings of fullness, boost metabolic rate and protect muscle makes them effective for losing weight and improving body composition. Increase muscle mass: Studies have shown a higher protein intake can increase muscle size and strength when combined with resistance training (20, 21). 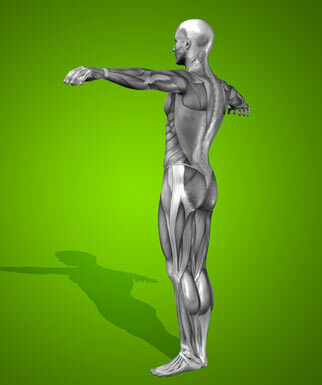 Reduce muscle loss during aging: Many people lose muscle as they age. One study found that adding a daily protein shake helped protect muscle health in healthy older men and those with age-related muscle loss (22, 23, 24). Strengthen bones: Higher protein intake may promote bone health. In one study, older women with the highest intake of animal protein experienced a whopping 69% reduced risk of hip fracture (25, 26, 27, 28). 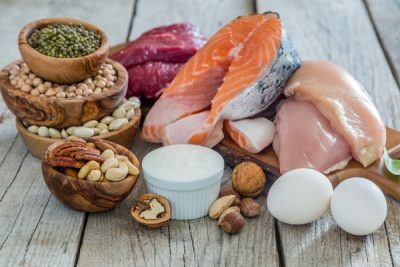 Improve wound healing: Studies have shown that high-protein diets can enhance the healing of wounds related to surgery or injury, including bedsores (29, 30, 31). Summary: Research suggests a high protein intake can help build muscle, protect against bone and muscle loss during aging and improve wound healing. How Much Protein Should You Eat Every Day? The optimal amount of protein to consume per day is somewhat controversial. Based on the DRI of 0.36 grams of protein per pound of body weight, or 0.8 grams per kilogram, a 150-pound (68-kg) person would need about 54 grams per day. While this may be enough to prevent outright protein deficiency, many experts believe this is too low for optimal health, including maintaining muscle mass (1, 32). In fact, studies have shown that older adults, in particular, require more protein than the DRI, concluding that 0.6 grams of protein per pound, or 1.3 grams per kilogram, may help prevent age-related muscle loss (33, 34). Furthermore, diets providing up to double the DRI at 0.75 grams of protein per pound, or 1.6 grams per kilogram, have been found to boost weight and fat loss, improve body composition and protect muscle during weight loss (1, 17, 18, 19, 35). However, increasing your protein intake beyond this amount doesn’t seem to provide additional benefits. One study showed men who consumed 0.75 grams of protein per pound, or 1.6 grams per kilogram, lost slightly more fat and had similar gains in muscle, compared to the group that consumed 1.1 grams per pound, or 2.4 grams per kilogram (18). A high-protein diet for weight loss and overall health should provide about 0.6–0.75 grams of protein per pound of body weight, or 1.2–1.6 grams per kilogram, and 20–30% of your calories per day. For the 150-pound (68-kg) person, this provides a broad range of about 82–110 grams of protein daily, depending on calorie intake. Moreover, it’s important to spread your protein intake evenly throughout the day, rather than consuming most of it at one meal. This allows your body to use protein most efficiently (32). Summary: Daily intake of 0.6–0.75 grams of protein per pound of body weight, or 1.2–1.6 grams per kilogram, may promote fat loss and protect against the loss of muscle mass during weight loss and aging. A high-protein diet is easy to follow and can be customized according to your own food preferences and health-related goals. For instance, you may want to follow a low-carb, high-protein diet to keep your blood sugar under control. If you avoid milk products, you can follow a dairy-free diet that is rich in protein. Even a vegetarian diet can be high in protein if it includes eggs or dairy and plenty of legumes and other plant proteins. Keep a food diary: Start a food diary using an app or website that provides protein values for thousands of foods and allows you to set your own calorie and macronutrient goals. Calculate protein needs: To calculate your protein needs, multiply your weight in pounds by 0.6–0.75 grams, or your weight in kilograms by 1.2–1.6 grams. 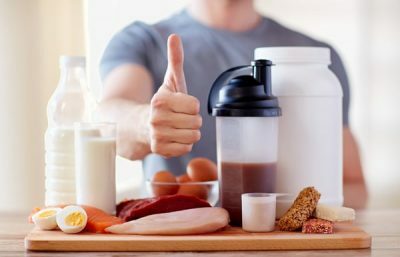 Eat at least 25–30 grams of protein at meals: Research has shown that consuming a minimum of 25 grams of protein at meals may promote weight loss, muscle maintenance and better overall health (35). Include both animal and plant proteins in your diet: Eating a combination of both types helps make your diet more nutritious overall. Choose high-quality protein sources: Focus on fresh meats, eggs, dairy and other proteins, rather than processed meats like bacon and lunch meats. Consume well-balanced meals: Balance high-protein foods with vegetables, fruits and other plant foods at every meal. Lastly, this list of 20 delicious high-protein foods can help get you started. Summary: Calculating your protein needs, tracking your intake in a food diary and planning well-balanced meals will help you get the best results on a high-protein diet. 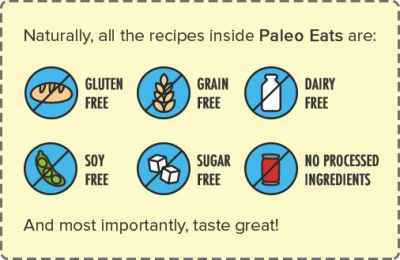 The sample below provides about 100 grams of protein per day. However, you can adjust the portions to meet your needs. Breakfast: 3 eggs, 1 slice whole grain toast with 1 tablespoon almond butter and a pear. Lunch: Fresh Avocado and Cottage Cheese Salad and an orange. Dinner: 6 ounces (170 g) steak, sweet potato and grilled zucchini. Breakfast: Smoothie made with 1 scoop protein powder, 1 cup coconut milk and strawberries. Lunch: 4 ounces (114 g) canned salmon, mixed greens, olive oil and vinegar and an apple. Dinner: 4 ounces (114 g) grilled chicken with quinoa and Brussels sprouts. Breakfast: Oatmeal and one cup plain Greek yogurt with 1/4 cup chopped pecans. Lunch: 4 ounces (114 g) chicken mixed with avocado and red bell pepper and a peach. Dinner: All Meat Veggie Chili and brown rice. Breakfast: Spanish omelet made with 3 eggs, 1 ounce cheese, chili peppers, black olives and salsa and an orange. Lunch: Leftover All Meat Veggie Chili and brown rice. Dinner: 4 ounces (114 g) halibut, lentils and broccoli. Breakfast: One cup cottage cheese with 1/4 cup chopped walnuts, diced apples and cinnamon. Lunch: 4 ounces (114 g) canned salmon mixed with healthy mayo on sprouted grain bread and carrot sticks. Dinner: Chicken Meatballs with Marinara Sauce, spaghetti squash and raspberries. Breakfast: Frittata made with 3 eggs, 1 ounce cheese and 1/2 cup diced potatoes. Lunch: Leftover Chicken Meatballs with Marinara Sauce and spaghetti squash with an apple. Dinner: 3 ounces (85 g) shrimp fajitas with grilled onions and bell peppers, guacamole, 1 cup black beans on a corn tortilla. Breakfast: Protein Pumpkin Pancakes topped with 1/4 cup chopped pecans. Lunch: One cup plain Greek yogurt mixed with 1/4 cup chopped mixed nuts and pineapple. Dinner: 6 ounces (170 g) grilled salmon, potatoes and sautéed spinach. Summary: Meals on a high-protein diet should include a moderate to large serving of protein balanced with healthy carb and fat sources. High-protein diets are safe and healthy for most people. Contrary to popular belief, higher protein intake doesn’t cause kidney problems in people with normal kidney function (36, 37). What’s more, a study found that when overweight people with diabetes and early-stage kidney disease consumed a weight loss diet consisting of 30% protein for 12 months, their kidney function didn’t worsen (38). On the other hand, people who already have moderate to advanced kidney disease typically need to reduce their protein intake in order to preserve remaining kidney function (39, 40). High-protein diets may also promote kidney stones in susceptible people. One study found this was mainly true for high amounts of animal protein, rather than vegetable protein (41, 42). In addition, people with liver disease or other serious health conditions should check with their doctor before beginning a high-protein diet. Summary: High-protein diets are safe and healthy for most people, but they may cause problems in individuals with certain diseases or health conditions. Protein is a unique and important nutrient. A higher protein intake is linked to beneficial effects on appetite, weight, body composition, aging and overall health. To reap maximum benefits from a high-protein diet, spread your protein intake throughout the day, choose high-quality sources and balance your intake with healthy fats and carbs. Next articleThe Dangers of Shopping at Dollar Stores; Chemicals Linked to Cancer, Birth Defects. Kris Gunnars is a medical student, personal trainer and someone who has spent years reading books, blogs and research studies on health and nutrition. 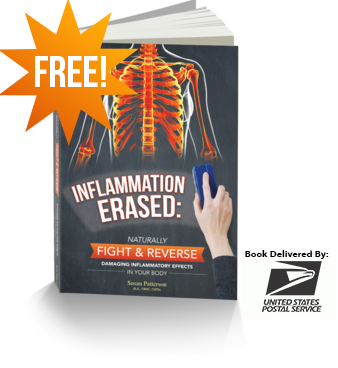 Kris believes that there is an immense amount of evidence that runs completely contradictory to what the governments and dietitians around the world are recommending. Since starting medical school and becoming a personal trainer, he's learned that the textbooks on nutrition that our future doctors and health authorities read are based on that same faulty or nonexistent evidence. Kris' goal is change that! For more from Kris- Subscribe to Free Updates from his website or click the links above to follow him on Facebook or Twitter.